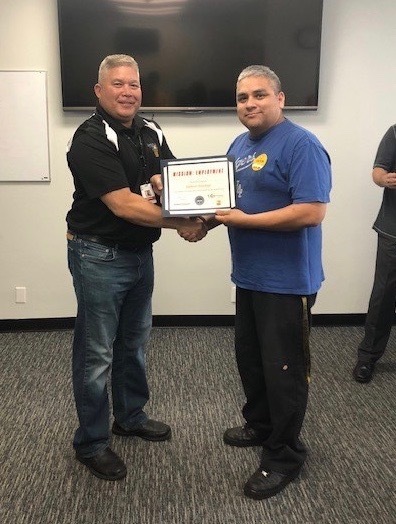 Ildefonzo proudly served in the United States Air Force as a Special Purpose Vehicle and Equipment Maintenance Journeyman for more than five years. After his service, Ildefonzo enrolled in the engineering program at Cerritos College and earned a certificate in Engineering Design Technology and an Associate in Arts in Engineering Design Technology. Without slowing down and working hard to further his education, he is now pursuing his Bachelor of Science in Industrial Technology. It was through the Veteran Resource Center on campus at Cerritos College that he was referred to the Tierney Center for Veteran Services. During his time with a Veteran Navigator, Ildefonzo opened up about his struggle to attend school full-time, work and provide enough financial and emotional support to his family. His hours at work were getting cut and he was having no luck finding new job opportunities. Ildefonzo was having a hard time balancing it all. That’s when the Tierney Center’s vast network of local employers and job placement resources came into play. Ildefonzo attended the Tierney Center’s job readiness course and worked one-on-one with a Veteran Navigator to refine his resume, highlight his skillset and certificates, and build confidence in mock interviews. After completing the course, the Tierney Center team set Ildefonzo up with an interview at Pure Aqua, a global leader in water treatment and reverse osmosis systems and water filter systems and purification for commercial and industrial use. He went into the interview confident that he could excel in this new career path. Ildefonzo aced the interview and quickly got hired. He now has a new career with good benefits for his family that allows him to work and attend school. He credits the Tierney Center for the confidence he needed to approach the opportunity and land the job. Ildefonzo (R) with Denton Knapp, Director, Tierney Center.